Literally one of the most demagogic stunts CNN has ever aired, but it had the right politics so naturally it just won a Cronkite Award for “journalism” from USC’s Norman Lear Center. 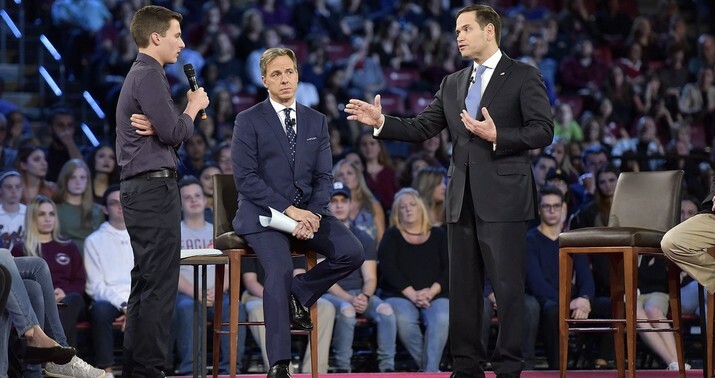 The full title of the award, by the way, is “The Walter Cronkite Award for Excellence in Television Political Journalism.” The official title of the CNN town hall was “Stand Up: The Students of Stoneman Douglas Demand Action.” It wasn’t journalism and wasn’t even presented as such. It was gun-control advocacy by its own terms. But again, the correct politics, so: Award-winning. Mm, yes, “advancing the conversation.” You may remember this as the event at which Parkland student Cameron Kasky stood up and told Marco Rubio to his face that he couldn’t look at him, knowing his support for the NRA, without seeing him behind the barrel of the gun firing at his murdered classmates. (Kasky now regrets some of his rhetoric.) This was also the event at which Sheriff Scott Israel stepped into the role of moral authority to lecture a national audience on gun violence. Israel later lost a no-confidence vote of the local deputies’ union in a landslide partly for his handing of the Parkland shooting; Ron DeSantis went on to suspend him and is now one of the more popular governors in the country because of it.